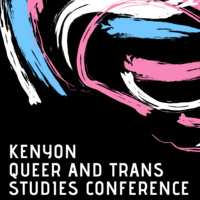 The Kenyon Queer and Trans Studies Conference is a new biennual conference. Sponsored by the Office of Diversity, Equity, and Inclusion, the conference developed from a need to provide a place for queer and trans scholarship, activism and community building. The conference is built upon a model of interdisciplinarity, intersectionality and equity. The Kenyon Queer and Trans Studies Conference includes four tracks: healthcare and technology; visual and performing arts; humanities and popular culture; and politics, society and the law. Each of these carefully selected tracks encompasses the desire to facilitate spaces for discussions about queer and trans issues in distinct areas of scholarship and everyday life. Recognizing the unique set of identities throughout the broader LGBTQ+ community, the Kenyon Queer and Trans Studies Conference also offers drop-in networking/socializing spaces for queer and trans people of color. These dedicated spaces are offered throughout conference sessions with the intent of creating intersectional spaces exclusive to attendees, who may want intra-community discussions throughout the day. The Kenyon Queer and Trans Studies Conference models itself on practices of equity building. The conference is free to eliminate some economic barriers that may prohibit students from attending, and it will include free breakfast and lunch, with the understanding that food insecurity is often an issue in marginalized communities. The conference will also utilize accessible spaces across campus when possible. More information about submitting a proposal to the conference and/or registering to attend is available online.